Located in the Northern Drakensberg in the Sterkfontein Nature Reserve at the foothills of the Drakensberg Escarpment, Wild Horses Lodge is the perfect location for a luxurious romantic getaway or exclusive location wedding! With panoramic views of the majestic Platberg Mountain and the vast Sterkfontein Dam, Wild Horses Lodge is a masterpiece of architectural design in local sandstone and offers an exclusive wedding venue, luxury accommodation for your guests, exquisite cuisine and a variety of activities centred around the dam and the abundant wildlife of the reserve and mountains. Many beautiful brides have had their dream wedding day become a reality at Wild Horses Lodge with every wish and desire catered for. Why not consider this for your wedding? The stunning mountain provides a setting that is exclusive and unique where the couple can customize their special day by meeting with the dedicated staff to discuss every important detail of this momentous occasion. “The fear of compromising our excellent cuisine, attention to detail and 5 star service, limits us to catering for not more than 40 guests. When the vows are over and the rings in place, this is the perfect place from which to begin your married life“. 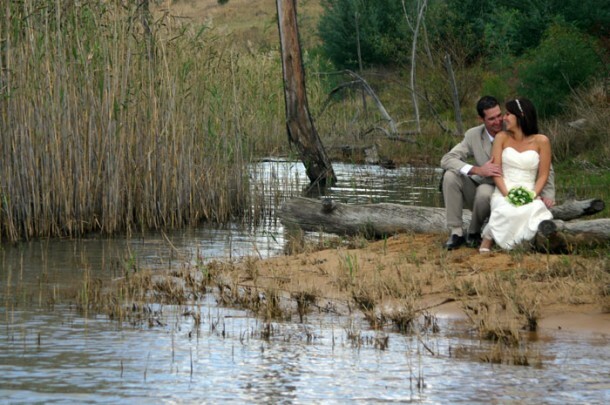 If you are interested in having your wedding at the lodge, contact Michelle on telephone +27 (0)58 622-7000 or on her mobile +27 (0)83 640-0024 or see additional info at Wild Horses Lodge.